Many independent tourists who visit Mojacar are in need of help and guidance on our local systems and customs in order to ensure a smooth holiday. If you experience anything other than a smooth experience, then you are not likely to return. Here are some guidance notes for tourists to make your stay in Mojacar even more enjoyable than ever, and of course we'd not only encourage you to return, but to tell your friends what a great part of the world this is and it truly is a MUST SEE area. For those tourists who are using public transport and are not hiring a car, there is a local bus service (Yellow buses) which operate a circular route. Starting at Puerto Marina hotel at the far end of Mojacar Playa (Carboneras end). 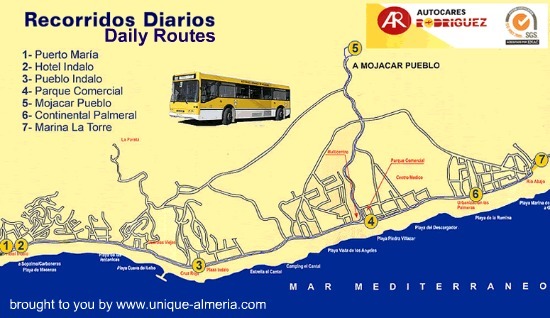 The bus time table is available from the tourism offices on the playa opposite Parque Comercial and also in Mojacar Pueblo (village) at the top of the hill. The bus timetable is also posted inside the buses. Also, pay close attention to the last bus details especially during the winter schedule (1st October to 31st May) as it is very easy to get stranded at the wrong end of the playa having caught the last bus from the pueblo. Do not rely on the timetable on the bus-stop signs as they have not been updated for over 12 months, and besides which most are illegible. Upon travelling from the Pueblo: If you are wishing to travel in the direction of Carboneras (to hotel accommodation, beaches, beachbars etc) from Parque Comercial, then do not fret if the bus zooms off in the opposite direction towards Garrucha when it reaches Parque Comercial - just enjoy the ride and the views. The bus is going to the hotels on the Garrucha road stretch to collect more passegners, but it does turn around and head back the other way. All trips are 1 euro regardless of number of stops. You can buy a 'carte' for 8 euros which will allow you 10 journies and you can ask the bus driver to punch it for two people. The bus driver will refuse to accept anything over 10 euros and if you present a 10 euro note then he will expect you to buy a 'carte' as they dislike changing high denomination notes. Five euros notes are fine, as is change of course. Try and find a landmark on a local map (e.g. Parque Comercial - the local shopping centre) and when you go to pay, just say 'Parque Comercial' - more often or not the bus driver will advise you when you have reached that stop, but do pay attention to the driver. You will be amazed how many people don't plan their bus journey in advance and have no idea where to go! :) If you are travelling from the hotel complexes at the Garrucha end of Mojacar and you wish to get to Mojacar Pueblo, then you disembark at Parque Comercial and walk around the corner to catch the other yellow bus to Mojacar Pueblo - you do not have to pay a second time and it is wise to retain your ticket from the first bus to show on entering the second bus. (Usually if you tell the driver Mojacar Pueblo when you get on the bus he will radio through to the second bus to tell the second driver that there are passengers for the pueblo). They try to co-ordinate timings but it isn't always 100% accurate. The last bus leaves Puerto Marina Hotel at 20.55 to go to the Pueblo - it arrives at the Pueblo and departs at 21.15 - however it only travels to the hotels at the Garrucha end of the beach - then it terminates here (this is the opposite end of the playa from Puerto Marina Hotel - and about a 6 kms walk back!). If you are staying at the Carboneras end of the playa (e.g. Puerto Marina Hotel or Best Indalo etc) then your last bus to take you back to that area departs from the Pueblo at 20.15! (Bearing in mind most Spanish don't venture out for dinner until 21.00 then all this is a ridiculous state of affairs but hey, that's Spain for you!). If you get 'caught out' i.e. stranded, then you either walk or take a taxi. Do not expect the bus drivers to speak English - they don't. There is only one taxi rank in Mojacar - opposite Parque Comercial by the bus stop. The taxis are efficient and clean - the drivers speak little English if any, but they are safe. The fares are relatively expensive. If you are away from Parque Comercial and you need a taxi then it is best to call into a bar, buy a drink, and ask them to order a taxi for you. The taxi telephone booking people speak only Spanish and very fast at that! It is always best to get a bi-lingual barman/barlady to order them on your behalf.